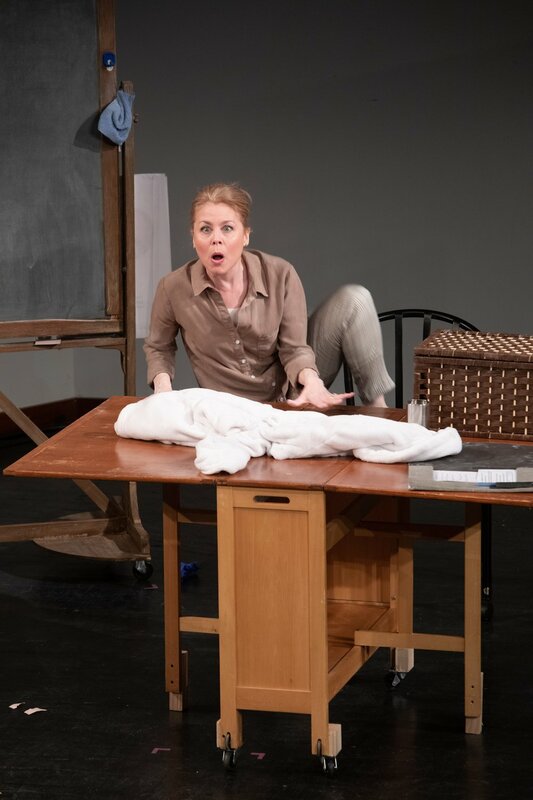 Kim Kivens in the Minnesota Jewish Theatre Company’s “What I Thought I Knew.” photo by sarah whiting. Maggie Bearmon Pistner, left, and Ashley Rose Montondo in a scene from “Collected Stories.” Photo by Sarah Whiting. Donald Margulies’ play is 22 years old, but it could have been written yesterday. The questions it raises – about authenticity, identity, cultural appropriation, and if it’s ever OK for one person to steal another’s story – are ones we’re asking today, with more heat. The play is all conversation between the two women. Over time, their relationship shifts. Lisa becomes Ruth’s assistant; they are teacher-student, employer-employee, mother-daughter, friends, rivals. In what she assumes is a conf­­­­­­­­­­­idential moment, Ruth shares the story of her long-ago affair with poet Delmore Schwartz (a real person; we occasionally hear his voice and some of his poetry). Then Lisa bases her first novel on Ruth’s life. The setting is Ruth’s sixth-floor Greenwich Village apartment. Filling it with books, art, a messy writer’s desk and comfortable chairs, scenic designer Michael Hoover makes it so inviting you don’t mind spending the evening there. It’s also thoroughly convincing. In the play’s first few moments, as Ruth struggles to open a sticky window, she leans out the opening and some audience members gasp. We’re already believing she’s high above the ground. See this if 1) you enjoy plays about writers/artists, 2) you like smart, talky plays, 3) you want to explore the topic of appropriation, 4) you’ve wondered about Montondo. She made the news in 2013 when she stepped into the lead role of Elizabeth Bennet in “Pride and Prejudice” at the Guthrie, after Erin Krakow backed out for a TV series the day before rehearsals were set to begin. Four performances remain: Wednesday and Thursday at 7:30 p.m., Saturday at 8 and Sunday at 1. FMI and tickets ($23-38); 651-647-4315. Was there a time when politics was about problem-solving instead of gaining and maintaining power? I know there was, but it sometimes seems a vague and hazy memory. So what happens when an incumbent U.S. senator, on the weekend before Election Day, decides to confront a personal crisis of faith in public? How will people react? Well, for those invested in the Republican senator keeping his career on the ascent, the answer is obvious: “Are you crazy?” And maybe the fictional senator, Charles Whitmore, is, as he and his entourage struggle with the battle between belief and winning, playing the political game and trying to affect change. That’s the central conflict in “Church & State,” a new play by Jason Odell Williams receiving its Twin Cities premiere in a very solid Minnesota Jewish Theatre Company production. While only one of the three principal characters is Jewish — the senator’s exasperated and edge-of-panic campaign manager — the issues of faith, doubt and how to put your religion to work in your life are right in the company’s wheelhouse. While Williams’ script could be more nuanced and the production’s pace could flow more swiftly and naturally, this is a very worthwhile conversation-starter of a show. So what set Sen. Whitmore off? Well, a gunman has shot up the elementary school his children attend, killing 29. When a blogger chats up the senator after a funeral, he’s stunned to find a man in power asking himself questions about how his view of God can co-exist with this tragedy. Like many, the senator is sick of this whole “thoughts and prayers” thing and is searching for ways to keep similar massacres from happening. And both his wife and campaign manager think that’s crazy. Establishing the tone is tricky for this play, for at first it seems as if it’s going to be a political farce, what with its wisecracks and overlapping dialogue. But director Michael Kissin soon settles us into a place where the issues at hand get the airing they deserve without getting ponderous or preachy. As Whitmore, Matthew Rein is every inch the career politician, projecting unflappability and friendliness, willing to toe the line of safety and predictability … until he isn’t. As campaign manager Alex Klein — a Jewish New York City Democrat hired because of her perfect track record in elections — Miriam Schwartz finds the sweet spot between toughness and vulnerability as she performs triage on a campaign she feels the senator is sabotaging. But stealing the show out from under them is Kim Kivens as the senator’s wife, Sara Whitmore. A fascinating combination of stand-by-your-man Southern belle and Lady Macbeth of the Carolinas, Kivens’ Sara projects an air of smiling ditziness before it becomes clear that she’s the architect of her husband’s career. (“He may wear the pants in our house, but I choose the pants.”) She also expresses some very believable sympathy to her man’s crisis of faith in one of the play’s most absorbing scenes, as the two go toe-to-toe behind closed doors. Yet don’t harbor the impression that this play is all reflection and rumination. There are a few significant plot twists within its 90 intermission-less minutes that send things off into unexpected directions. While it might eventually put too much faith in a system it’s been calling into question, that’s just one more subject for the post-show discussions you’ll likely want to have upon experiencing it. Capsule: A solid staging of a thought-provoking play about faith and politics. In 1997, British playwright David Hare(whose work was recently seen in the Twin Cities via Park Square Theatre's production of Amy's View) traveled to Israel and Palestine to do research for a play about British involvement in the area. What he came away with was a one-man play in which he, the playwright, tells stories from his journey there. Minnesota Jewish Theatre Company is presenting Via Dolorosa to begin their 23rd season, and wow, is it fascinating. I realized just how little I know about the subject, and felt like I should have been taking notes for this engaging lecture. Vaguely familiar phrases like Six-Day War and Oslo Peace Accord sent me scurrying to Wikipedia this morning for details, but it would take weeks, months, years of study to understand all the complexities and centuries of history. This play doesn't attempt to spell everything out, but rather give one man's impression of the land he experienced and the people he met. On his journey, Hare talked to people on both sides of the conflict, people with vastly different opinions even within one side. People who were young and old, famous and not. He seems to truly like most of the people he met with and presents their stories without judgement. As the original director of the play said, rather than taking a side, what Via Dolorosa speaks out against is extremism. There's a great sense of sadness in the piece, as there doesn't seem to be any end to the conflict in sight. Even now, 20 years later, it continues. Although the playwright did perform his own work originally in London, subsequent productions, of course, have cast an actor (despite one of the first lines of the play being "I am not an actor"). I can think of no better #TCTheater actor to perform this role than the great Robert Dorfman (with an excellent TC directing debut by actor Raye Birk). Robert is so natural that you almost forget that he isn't the person who lived this experience. With that trademark twinkle in his eye, he brings the audience right into his story with warmth and humor, making it all the more powerful when the twinkle goes out and the story turns dark. The house lights are up for most of the show, so it does feel like an intimate conversation as Robert looks directly at the audience and even responds to audience reaction. It's such a pleasure to go on this at times difficult and complicated journey with him. The show is performed on a mostly bare and empty stage, against a backdrop of many, many boxes, a few of which he unpacks as he tells his story, perhaps representing the mountains of history, writings, and opinions about Israel and Palestine (scenic design by Michael Hoover). The world is so big, and so old, and so filled with people and their stories. I don't know if I'll ever have the chance to visit Israel, but I'm glad I got the opportunity to experience it, even a little, through theater (as I do so many things). Only four performances remain in the limited run of Via Dolorosa, so act fast to see this compelling, thought-provoking, moving play.